The fate of moose in New Hampshire is embedded in a complex of ecological factors, most notable among them, climate change. A healthy bull moose takes a break from browsing. We saw three moose in one day. That may seem like an odd highlight to mention in describing a fishing trip, but in the Connecticut Lakes region of far northern New Hampshire, where I recently spent a long weekend with my brother John and his son Owen, moose have sometimes been scarce in recent years. So, a three-moose day is a really good one. Although the fate of the moose population in New Hampshire may seem like a distant concern from our vantage in the Prairie State, it’s embedded in a complex of ecological factors that hold broader interest, most notable among them, climate change. Moose populations in the state have varied greatly over time. At the time of European settlement, moose were abundant, but by the middle of the nineteenth century they had been nearly extirpated as a result of overhunting and habitat loss. Reductions in the amount of land being farmed and changes in forestry practices enabled them to begin a real comeback in the 1970s, and numbers were high enough to support carefully regulated hunting by 1988. The statewide moose population in New Hampshire peaked at about 7,400 animals in the 1990s, but even then, moose numbers in the north country never reached levels biologists had anticipated the habitat could support. Why weren’t there more of them? And why did their numbers then begin dropping off? A study conducted between 2001 and 2006 confirmed the primary cause of mortality among moose in the northern half of the state to be winter tick, which is the common name for a particular species of tick. Winter ticks hatch in summer from eggs laid on the ground by females of the previous generation. By fall, these larval ticks climb a plant to “quest” for a warm-blooded host on which to spend the winter and feed. (When questing, great numbers of winter tick larvae hook their legs together so that when one of them catches onto a host masses of others are brought along with it.) In spring, once they are fully engorged, female winter ticks drop to the ground and lay eggs to produce the next generation. It’s during the winter that these ticks afflict moose, and the health of moose that are heavily infested is compromised in multiple ways. They experience significant blood loss, they spend too little time feeding and too much time grooming, their fat reserves are depleted, and they lose protection from the cold as they rub off large patches of their own fur trying to get rid of the ticks. Where moose occupy the landscape densely, their best defense against winter ticks is weather. A winter that arrives on schedule kills enough questing ticks to reduce the load on moose. And when freezing conditions persist into spring, some adult ticks fall off into snow rather than onto the ground, and die before they’re able to lay eggs. 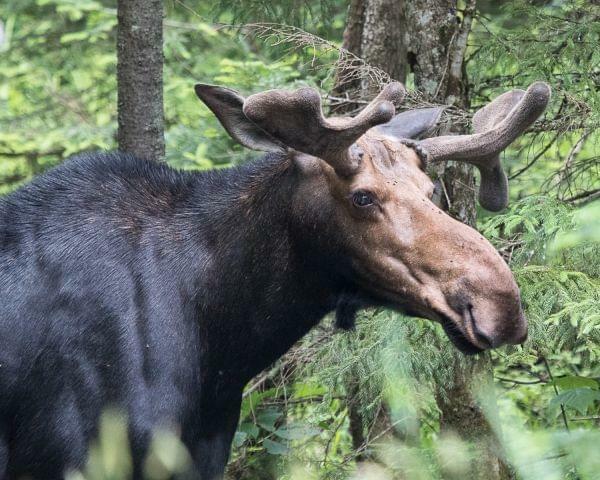 Sadly for moose, the weather in New Hampshire in the past three decades has not been a reliable ally; with increasing frequency, winter has arrived late and spring has come early, giving ticks an edge. To be clear, the problem is not that the weather in northern New Hampshire never favors moose anymore, and the past winter is a good case in point. The first frost came early and the moose did well thanks to low loads of winter tick. The problem is that climate change makes it less and less likely that winters will favor the moose.